These bags are unsorted, we ship them to you the same way they come in, so you may get some larger ones for the cost of the smaller ones or be undyed or dyed based on stock if this is a problem ask before buying. Available in 3, 6, 12, 25, 50 & 100 count lots in sizes 3"+, 4"+, 5"+, and 6"+.& 7"+ in size. Lot sizes are based on the starfish size and stocks. These sizes are the most popular with our crafters, wedding planners and collectors. Great to use in Crafts, Wedding, Decorations, Christmas and more!Free standard shipping! Sizes and color tints are not exact and sold in a rough range not exact and may possibly be slightly smaller or larger. 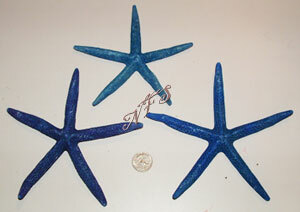 These starfish come in a wide variety of tints and will and do vary from the natural or dyed colors as shown based on the stock at the time of your order. For a specific color we advise painting them with a spray paint to the color you will need. sorry we do not do special size or color requests. Nice selection of sizes and color tints. Crafters love them. Shipped safe and fast. Starting at $5.95 Free shipping! As low as $6.95 each. + Free Shipping!